Growing Together Program offers the interns competitive wages, housing assistance, intern networking events, travel assistance, hands-on mining experience and consideration for university scholarships. 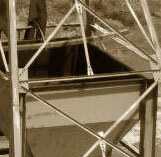 Mining interns work as manual laborers or miner's assistants. They go into the pit, build tunnels and access roads, operate machinery, and help extract the minerals. Daily, on-site contact with mine workers familiarizes the intern with their working conditions and helps develop the ability to communicate with them. Technical work involves surveying, designing ventilation and mineral transport systems, planning drilling and blasting operations, conducting time and cost studies and implementing security and health measures. Please apply early. Internships will be awarded on a rolling basis until all positions are allocated.